WOLVERHAMPTON maintained their unbeaten start at home with a dominant 59-30 victory over King's Lynn. 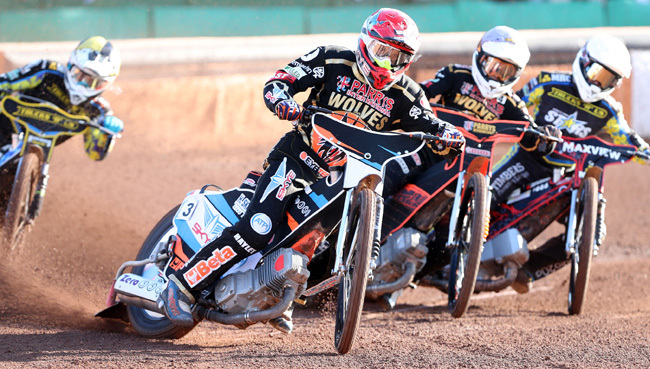 The Parrys International Wolves were in sensational form once again as they won 14 out of the 15 races in front of a bumper crowd at Monmore Green. Peter Adams' side made life much easier for themselves by making some quick starts and opened with six straight heat advantages. Recent signing Rory Schlein took the chequered flag in two of those races and admits he already feels at home with the Wolves. "I've done plenty of laps around that track over the years so I didn't think it would take me too long to settle down," Schlein admitted. "I had a decent one against Rye House last week and I was happy with how my night went tonight as well. "The atmosphere in the team is great and we certainly mean business!" Club captain Freddie Lindgren reeled off four straight wins as he extended his formidable form at Monmore Green. A 12 point, four ride maximum means he is now unbeaten by an opposing rider in the Wolves' last three home fixtures. Fellow Swede Jacob Thorssell dropped just one point to an opposing rider, when newly crowned British Under-21 Champion Robert Lambert claimed the visitors only race win of the night in heat nine. Schlein and Aussie ace Sam Masters both bagged a hat-trick of race wins a-piece as they provided solid back up for the Swedish spearhead. Kyle Howarth recovered from a spill in his opener to bag six points while there were plenty of encouraging signs once again from reserve duo Nathan Greaves and Mark Riss. The Parrys International Wolves are next in action this Friday when they travel to SGB Premiership newcomers Somerset. WOLVERHAMPTON 59: Jacob Thorssell 12+2, Freddie Lindgren 12, Rory Schlein 11+1, Sam Masters 9, Kyle Howarth 6+1, Nathan Greaves 5+1, Mark Riss 4. KING’S LYNN 30: Robert Lambert 11, Chris Holder 5+2, Troy Batchelor 5+1, Lewis Rose 4, Nicklas Porsing 4, Josh Bailey 1, Danny Halsey 0.